"If there's nothing to do, then don't do anything, the way you do in life. Just sit there and listen, or nod, or whatever." The Bravo series Inside the Actors Studio offers a unique look into the technique and outlook of some of today's major actors. 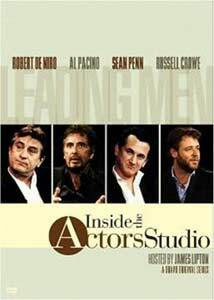 This three-DVD set collects four episodes that feature some of today's most respected leading men, most of them very private and seldom willing to talk about their craft. Host James Lipton fails to make the most of the possibilities, however, as he's far too overprepared. He comes up with trivia that the guests don't remember, leading to an endless string of awkward leading questions that he ends up answering himself. It's seldom a good idea to try to upstage Robert De Niro or Al Pacino, and Lipton's not one who can pull it off. His annoying list of silly questions he asks each guest doesn't help either and just seems like a waste of precious time. On the other hand, even Lipton can't spoil the intriguing things that these stars have to say. The Robert De Niro episode (original air date 24 January 1999) has a lot of promise, but De Niro is unfortunately shy. Lipton is at his worst here, initially getting just yes or no answers, and in the few instances where De Niro starts to open up, he interrupts and ruins the flow. De Niro does, however, manage to get in a few insights about his relationship with Martin Scorsese, and the process of studying Brando closely for The Godfather Part II. The Raging Bull section is also interesting in his preparation for the role. One of the more practical bits of advice is that despite the importance of preparation, there's equal importance in stopping your preparation and just taking the leap forward. He sheepishly refuses to recite the famous "Are you looking at me?" soliloquy from Taxi Driver, though Lipton can't bring himself to ask the obvious followup question as to why. Al Pacino earns himself a double-length episode (2 October 2006) that evolves into a thorough career overview. Pacino's far more chatty than De Niro and once he loosens up he's surprisingly candid. For once Lipton's research fails him, and Pacino manages to surprise with the revelation that at one point in his career he did standup comedy, of all things. The Actors Studio lovefest gets a bit overwhelming here, since Lipton feels it's incumbent upon him to point out each and every cameo by Lee Strasberg in Pacino's movies, whether germane to the conversation or not. Fine, he's an important figure in the history of the Actors Studio, but we get it already. Sean Penn offers an articulate and interesting view of acting as opposed to writing and directing in his 28 February 1999 episode. There are some candid moments about his 8mm filmmaking with Martin Sheen's children as a boy, and he's unsurprisingly embarrassed when Lipton brings up Fast Times at Ridgemont High. One of the best moments occurs when he relates how he terrorized Christopher Walken on set in order to get a specific reaction. The Actors Studio stroking continues with extraneous introductions of Arthur Penn and Ellen Burstyn, then on the board of the Studio. I have no particular liking for Sean Penn, but he is obviously a thoughtful creator and he has some interesting observations to offer. Easily the most watchable of the four episodes is devoted to Russell Crowe (4 January 2004). Affably chatting about his career, he recounts all the abuse that his body has taken over the years from his all-out approach to his roles. Crowe makes quite a contrast to the introspective Penn, who rejects the idea of movies as entertainment (with the classic rejoinder "If you want entertainment, get a couple of hookers and an eight ball"), with his stated belief that the entire reason for his being is entertainment. Weirdly, Crowe's body language is quite in contrast to his personable demeanor; he's hunched over like a boy on detention and almost seems ashamed to be there. He doesn't lose sight of the fact that he's ostensibly teaching a class, though, and of the four he offers by far the most practical advice to the students in the audience. And in the big picture, we're students too as we watch these episodes, and there's quite a bit to learn here. It should be noted that the 5 1/4 hour running time listed on the box is overstated by over an hour, however. Image Transfer Review: The full frame picture looks reasonably good for a low-budget television production. There's frequently excellent shadow detail with the varieties of black worn by the participants readily distinguishable. There are minor bits of aliasing at times during the interviews, but on the whole they look quite nice. Some of the film clip segments have a video look to them, with rolling lines often visible. The color palette is unsurprisingly rather limited, but it seems to be reproduced faithfully enough. Audio Transfer Review: The 2.0 audio is serviceable enough, with limited hiss and noise. The frequent (and annoying) outbursts of applause whenever a title is mentioned are at least mixed well so that they're not overpowering. The dialogue is center-oriented and there's little directionality evident. Extras Review: Lipton offers brief and pointless introductions for the episodes. The real meat of the extras are a series of twenty deleted scenes, some of which contain important material (such as De Niro's discussion of The Deer Hunter and The Untouchables, or Penn describing what it's like to direct Jack Nicholson). They're essential viewing and well worth checking out. The packaging is ridiculously wasteful; the programs are presented on three single layer discs when they could have fit on two dual-layer discs easily. Some fascinating glimpses into the craft of some of the greats are marred a bit by a clumsy host who's far too full of himself. The deleted scenes are as good as anything in the main programs, though.